Patrice Evra seems to be heading towards the end of his Serie A career with Juventus, as director Beppe Marotta admitted that the left back is considering his future, and a possible move back to Old Trafford might be on the cards. 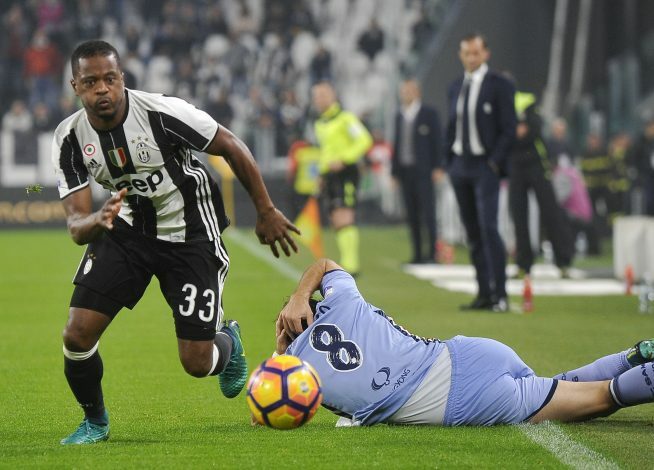 Evra has off late been a huge hit on social media platforms with his videos and photos, and that has worried Juventus’s management, who have criticised the player for not focusing on his performances on the pitch and putting his efforts into the social world. Patrice Evra was publicly criticised by Allegri for his failure to mark Suso against AC Milan. The fact that Evra and manager Allegri maintain a poor relationship with each other after their changing room quarrel post the AC Milan cup loss is a further reason causing the player to head away from the team. TuttoSport, based in Turin, have revealed Juventus have sparked interest in Mattia De Sciglio to replace Evra once his move to United is finalised. The 24-year-old defender is a versatile player who can play on right as well as left, and has already appeared 30 times for the Italian National team – 3 of them coming in Euro 2016 under Antonio Conte. Allegri was the manager to hand Sciglio his debut in 2011 for Milan, and a reunion seems to be on the verge of taking place. Evra’s return to Manchester United, where he spent a great 8 years filled with pride and trophies, could be of highly beneficial experience for Luke Shaw to gather and learn from.